Dinner is a huge deal for families. Huge. You need to have a plan and a running list of dinner ideas for the week. Family dinners at home also tend to save money (oh, so much money), save time, and give you a measure of control over a basic necessity in your family’s life. They also happen to be an awesome time to schedule family worship as a regular routine (this doesn’t have to be fancy–just read the Bible and pray together). So, we know we should be making family dinners on a regular basis. We know it’s important. And yet, if we don’t establish a plan for our family, dinner can become a daily “surprise”. One that sneaks up on us every single day. As a working, homeschooling mom with a health challenge, I’ve found that planning simple dinners, cooking ahead in bulk for times that really are a surprise, and having the tools I need to do so, make family life easier, saner, and more satisfying. Think of this post as an ultimate dinner ideas for the week strategy guide. In addition to dinner ideas for the week, there’s a free printable set of cute recipe cards I made, and I’m giving you a list of the tools I find indispensable for bulk cooking. Plus, I’ll tell you how I learned to cook easy, healthy meals every night. I’m having so much fun making printables for you. I hope they’re a blessing to you as well. You’ll find the the download link for the Free Recipe Cards at the very end. These fanciful recipe cards are absolutely free to Thinking Kids subscribers. Plus, you’ll get weekly encouragement, and exclusive offers. Our family benefits SO much from having dinner together every night. I’ll be honest, I didn’t enter marriage with a whole lot of amazing skills in the homemaking department, so making dinner for my instant family was kind of a shock. I actually taught myself to cook by cooking through nutritionist Leanne Ely’s Saving Dinner three times (so for three years!). That book was some of the best money I’ve ever spent. As I was finding the link to the updated version for you, I realized she has a whole line of these books now including Saving Dinner the Low-Carb Way (I just ordered it), Saving Dinner the Vegetarian Way, and Saving Dinner Basics: How to Cook Even If You Don’t Know How. Ms. Ely has some paleo volumes as well. The Saving Dinner line has weekly healthy seasonal menu plans, recipes, and a weekly grocery list. I can’t think of a more cost-efficient, easy way to learn to cook healthy dinners–and to learn to meal plan. Some days, my dinner plans go perfectly. I stop what I’m doing at 4:45pm, start prepping dinner, teach my teens a new kitchen skill (or employ them in utilizing one they already excel at), and we’re eating a healthy, nutritious dinner by 6pm. Other days, I have a looming deadline, there’s a soccer practice during dinner prep time, or I’m not feeling well and my dinner-making energy is best conserved for another night. The only real constant about surprise dinner disasters is that they aren’t really a surprise. When they happen is a surprise. But the fact that they happen is not. Once or twice a week, I take the extra time to triple or quadruple a recipe, or to mass prepare some common element of dinners. I’ll make 5 gallons of stew, an extra batch of spaghetti sauce, or chop and sauté an entire bag of onions, garlic, carrots, or ground turkey. I portion these elements (or a whole dinner) out and store them in Ziploc freezer bags or containers. I also like to combine raw ingredients (like for marinated chicken or shredded BBQ pork) to throw in the Crock Pot or Instant Pot. Taking the time to prepare extra food when I’m already cooking has been well worth the time and expense for our family. The extra freezer we purchased second-hand has been well worth the investment as well. Batch cooking is all the rage right now. To be honest, I’m not up for a full day in the kitchen making 40 meals. But I can spend two hours and come out with four meals, or three hours and have 20 sides of cooked spaghetti squash (purchased in season) packed into the freezer. That kind of smaller batch cooking fits my life perfectly. Our family has a number of favorite go-to meals for dinner that we use often. You can find great recipes on the internet or in cookbooks, but most are a variation on a simple theme. We make sure every dinner has a protein, a veggie, and some carbs (grains) for our quickly growing teens (I stay away from them, so I like to keep them separate). Here’s a list of dinner ideas for the week. As you find variations you love, be sure to write them on your recipe cards (you’ll find the download at the end of the post). Having two or three variations of each meal can keep mealtimes from becoming boring or stale for your family. For instance, you can have meatloaf every couple weeks if you are alternating between 3 or 4 different recipes, and your family will feel like there’s a huge variety in your family meals. With veggies, keep it simple! Wash them up, cut and trim them if necessary, throw them on a baking tray with some oil spray and no-salt seasoning, and roast the in the oven. It takes about 20 minutes and they’re always great. Don’t like veggies? It’s ok. You’re tastes will adjust as you practice eating them. Starchy veggies don’t count in this category. Healthy starches and carbs are vital for your child. Many families fall into one of the dual traps of serving mostly carb-based meals (carbs tend to be inexpensive), or of withholding carbs altogether as they strive for health. I don’t eat many carbs personally because of medication I take, but I know my growing kids need carbs to fuel their brains and bodies. My hard-working contractor husband needs carbs too. We focus on healthy carbs, with infrequent bread or pasta side dishes. Your family needs some healthy fats, too. These can be added in pretty easily as an accent to the meal. I try to keep everything in the kitchen pretty simple. That said, there are some really necessary tools for cooking ahead and serving simple, healthy meals during the week. Because I cook in bulk and freeze ahead, I use a few dinner tools that are a little unusual. Here are a few of my favorite dinner tools. 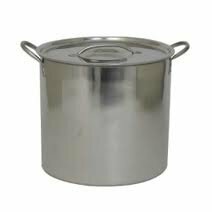 5 Gallon Stainless Steel Stock Pot with Lid ~ If you’re going to bulk cook soups, stews, and bean dishes, you’ll need a big pot! 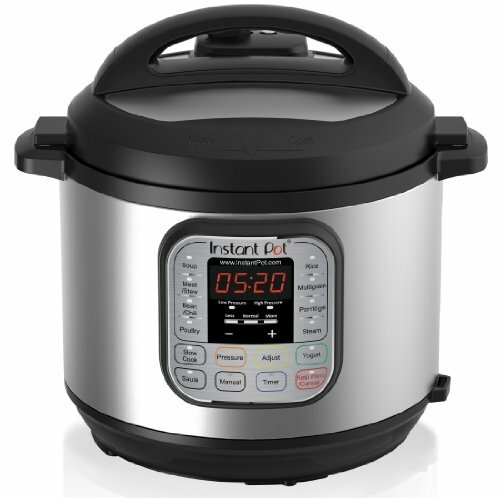 Instant Pot 7-in-1 Multi-Functional Pressure Cooker, 6Qt/1000W – Normally, I would have put a crock pot here, but I understand the Instant Pot beats the crock in every way! 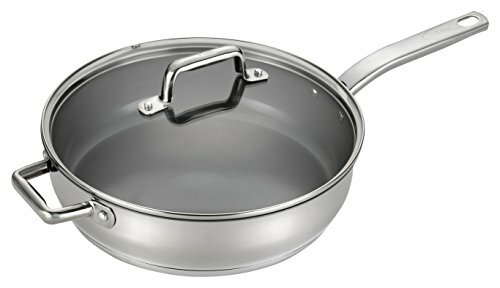 T-falPrecision Stainless Steel Nonstick Ceramic Coating Jumbo Pan Fry Pan Cookware, 5-Quart, Silver ~ To cook large amounts of veggies or meat, you’ll need a great big pan. 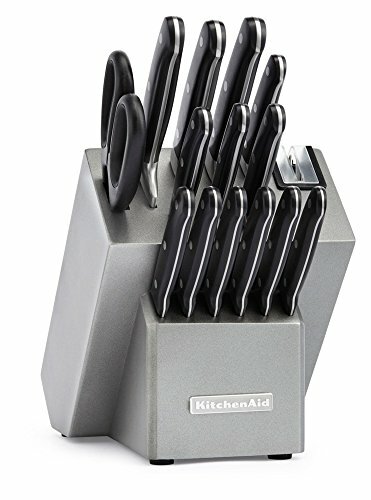 KitchenAid 16 Piece Classic Forged Series Triple Rivet Cutlery Set, Silver ~ I LOVE my KitchenAid knives. They’re ten years old, and it may finally be time for another set. 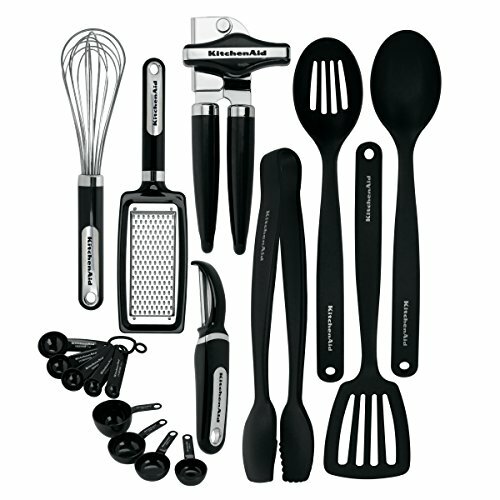 KitchenAid 17-Piece Tools and Gadget Set ~ I also love my KitchenAid tools. I have a variet that I really value, but this will get you started. 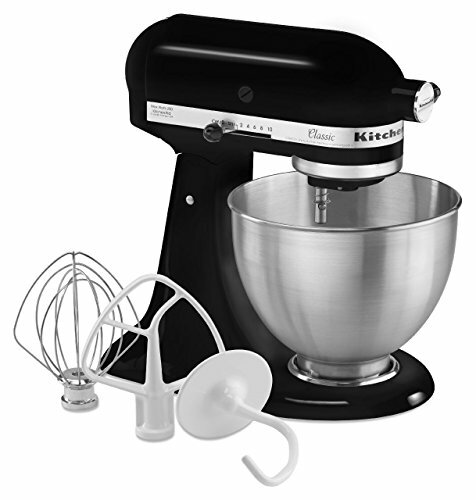 KitchenAid 4.5-Quart Classic Series Stand Mixer ~ If you need to mix anything in bulk, you’ll want a stand mixer, and KitchenAid is an awesome choice. I have a professional with steel gears, but the classic is more affordable, and works well too. 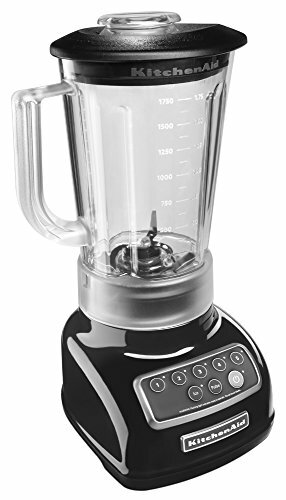 KitchenAid 5-Speed Blender with 56-Ounce BPA-Free Pitcher ~ I also love my KitchenAid blender. I use it for sauces and soup bases. 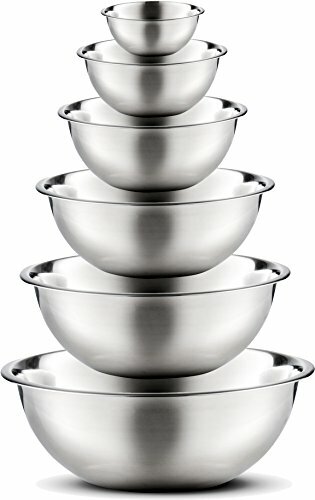 Stainless Steel Mixing Bowls ~ ~ I love my stainless steel mixing bowls for cooking ahead, washing veggies, and mixing all manner of things together. I also have a huge bowl for larger amounts. 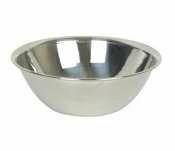 Mixing Bowl, 30-Quart ~ For any kind of bulk cooking, you’ll want a super huge mixing bowl. 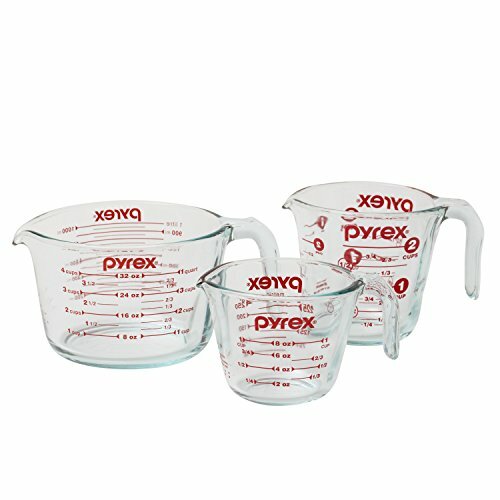 Pyrex 3-Piece Glass Measuring Cup Set ~ These are perfect for measuring large quantities of liquid. Just enter your information in the form below and I’ll send over your free recipe cards! I was 26 when we started having kids. We have 4 kids about 2 years apart each. I was 26 and I have two kids. I Was 23 when I became a mom. Now I have 5 kids, ages 11 and down. I got married 2 weeks after I turned 20 and 4 months later we became pregnant with our first. I had her a little over a month after I turned 21. We never anticipated allowing the Lord to control our family size, but we were both convicted about using contraception and now 28 1/2 years later we have 7 beautiful blessings ages 27, 24, 22, 21, 19, 17, and 15. I love it!! 21 when I had my first. Now I have two. I also Babysit in my home six other kids. So we are busy and blessed. I was exactly 1 week shy of 30 when our first kiddo was born. #2 came along 3.5 years later. Married at 21, first baby at 22. We have 11 kiddos… Ages 23- 3. 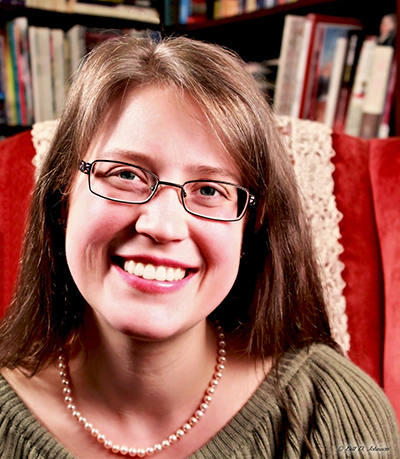 I was twenty-three when I became a mom. I was 38 with my first! 40 with my second. 2 beautiful girls, they are 6 and 9 now. I was 31 when I became a mother, and I now have two children. Thanks for the great giveaway! I was 25 when I gave birth to our firstborn. I was 37 before I got to bring a child home. We have 5 precious ones who have gone on before us and one son the Lord has entrusted to our care to raise up in the nurture and admonition of the Lord. I had my first baby at 30 and now have 2 munchkins! I had my first baby at 26. Now I have 2 and another on the way! Just one kiddo here. I was told having another would kill me due to uterine rupture, so no more for me. I was 26/27 with my oldest. We currently have four kids. I was 25 when I had my first child. I have three children- two boys and one girl. I was 29 when I had my first and I have 4 now. I was 22 when I had my daughter , I have two children now. I was 20 when i had my first child and we are expecting our 5th child in a month. Such a pity it is for US residents only. I would love to have an instant pot. But I live in the Netherlands. I can never take part in these sweepstakes. Hilde, I wish the laws and customs issues weren’t so prohibitive! I know all of us would like to open these giveaways up to all of our readers. I was 17 when I had my first and 43 when I had my fourth and last..
My first son was born when I was 18. I’ve had 6 kids, the last at age 33. Nothing better than large family! I was 24 when my first son was born. I have 3 boys. I have one kid. I was 28 when I became a mom. I was 32 when I had my first. I have two wonderful kids! I was 20 when I became a mom and I have 3 children now. I was 31 and we have 2 children now. I am 47 and have four wonderful children 21, 18, 14 and 12. I became a mom at 26 years old and I have 5 children! I was eighteen and had 2 girls and 1 boy.